Following a traffic stop on U.S. 35, 453 grams of suspected methamphetamine was found in a vehicle worth an estimated $43,000. GALLIA COUNTY — Two women from Columbus were arrested and are facing a drug charge following a traffic stop on U.S. 35. According to a press release from the Ohio State Highway Patrol, on May 4, troopers stopped a 2006 Honda Civic with Ohio registration for an alleged marked lanes and license plate violation on U.S. 35 in Gallia County. Criminal indicators were reportedly observed and a Rio Grande Police Department drug-sniffing canine alerted to the vehicle. A probable cause search revealed 453 grams of suspected methamphetamine in the vehicle worth $43,000, according to OSHP. The driver, Erica Mix, 27, and passenger, Michelle Mix, 49, both from Columbus, were charged with possession of methamphetamine, a first-degree felony. Both were incarcerated in the Gallia County Jail. 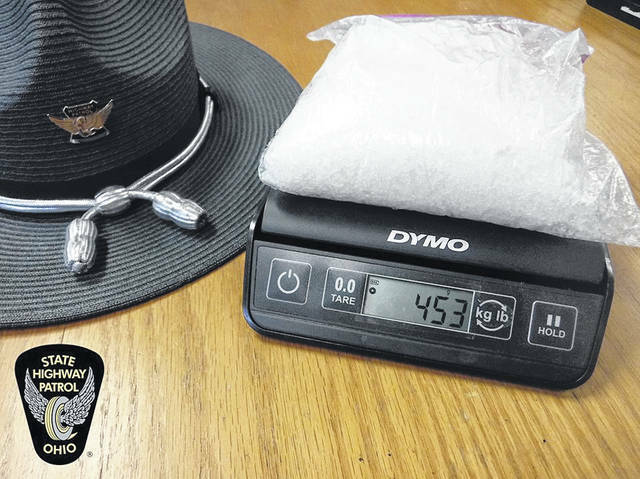 https://www.mydailytribune.com/wp-content/uploads/sites/42/2018/05/web1_Trooperbust-1.jpgFollowing a traffic stop on U.S. 35, 453 grams of suspected methamphetamine was found in a vehicle worth an estimated $43,000.